Flock and gather are super excited to introduce Adrienne Gradauer and Zach Quin who work out of their small studio in their 1914 home in Maple Creek Saskatchewan. Adrienne completed her BFA in Ceramics in 1998 at the Alberta College of Art & Design in Calgary. Zach studied jewellery, sculpture and glass at the ACAD & only took an elective in ceramics. It wasn't until after their time at ACAD that Adrienne introduced Zach to the wheel. Together they make tableware and other functional pots from porcelain and stoneware. 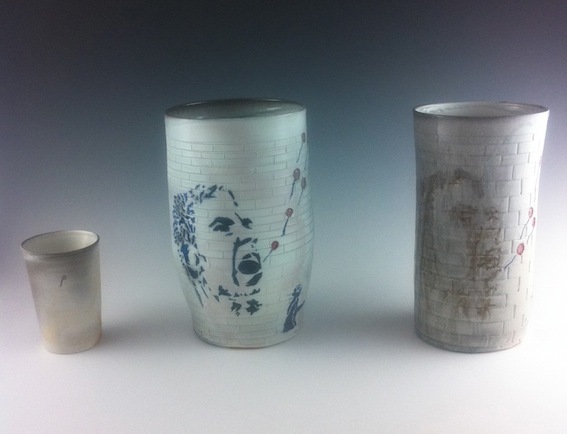 Adrienne tends to focus on traditional forms in stoneware, she has worked for several production potters and has spent time in Japan researching traditional Japanese pottery.Zach tends to focuses on simple porcelain forms with graphic images.